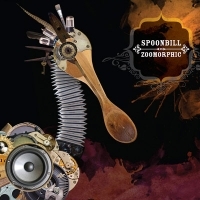 Omelette proudly presents Spoonbill's 3rd album: Zoomorphic. After nearly two years of questing through the audio underworld, wrestling crocodile-headed samplers and taming fire-breathing speaker stacks, Spoonbill has returned to the earth's surface, ready to address his ecstatic followers. This time around, Spoonbill's anarchic, quirk-funk, glitched-up aesthetic has been forensically finessed like never before, sculpted to a well-bodied medley of groove-based sound art. Expect an awesome spectacle of unprecedented electronica, flanked by a flock of live musos, wild visuals and warped theatrical performances. Supports by some very special guests. Tickets available at 57 Swan St Richmond from Mon – Sat 11am-8pm. 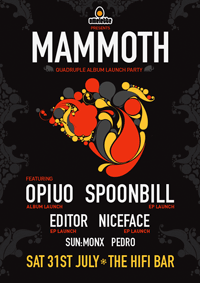 MAMMOTH - Opiuo, Spoonbill, Editor & Niceface - Combined Launch Party! Saturday 31st July Melbourne’s Hifi Bar will play host to the quadruple launch event for; Opiuo’s Debut album, Spoonbill’s new EP, Editor’s new EP, and the debut Niceface show, all joining forces to create one massive sonic spectacle that will shake the town’s foundations. This event promises to rock the block all night with solid stomping funked up sounds, visuals and theatrical performances... get ready for the stampede! Presale Tickets from http://www.thehifi.com.au/ or Polyester Records.